For Sale in for Fixed Price £260,000. Sizeable elevated site of approximately 10 Hectares (24 Acres) with planning consent for substantial detached house. 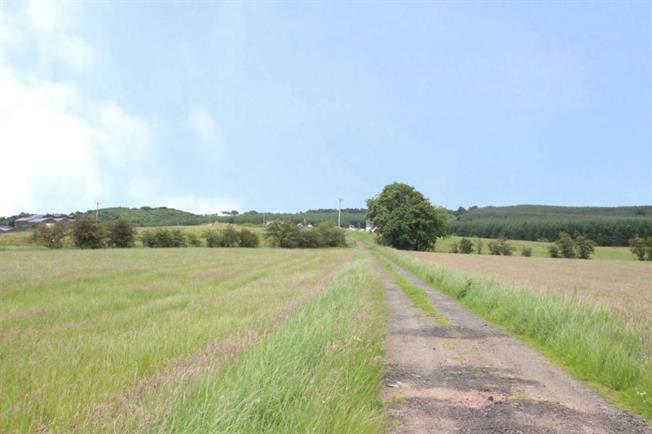 Enjoying a fabulous semi rural position with splendid countryside views and a high degree of privacy this site represents a seldom available opportunity to build a bespoke property with acreage which will prove to be especially popular with those of equestrian pursuits or choosing to run a small business. The building warrant application can be found on The North Lanarkshire Council website under reference 13/01454/NERE. The ground currently houses a temporary lodge style property with services, substantial areas of hard standing and an industrial shed measuring approximately 60ft by 40ft. Foundations for the detached villa are in place also. Set on the outskirts of Airdrie the site is ideally placed to provide the discerning buyer with both much desired semi rural living though also enjoying easy access to a variety of local facilities such as shopping, quality schooling, varied leisure pursuits and motorway network and train station. The site is of a size and style seldom available within the market place and offers purchasers the opportunity to tailor both the accommodation and ground to their requirements.